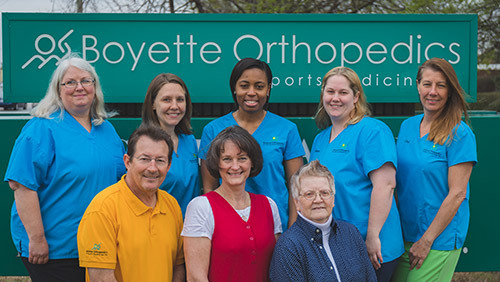 Boyette Orthopedics & Sports Medicine is located at 2573 Stantonsburg Road, Suite B, Greenville, NC 27834. Our office fronts Bowman Gray Drive and we encourage patients to use the entrance on that street. 8 a.m. – 5 p.m., Monday – Friday, excluding holidays. We are closed New Years Day, Easter, Memorial Day, Independence Day, Labor Day, Thanksgiving, Friday after Thanksgiving, Christmas Eve Day, and Christmas. Driving West on Stantonsburg Road, turn left onto Bethesda Drive. Take the next left onto Bowman Gray Drive. Our office is in Suite B at the back of the third building on the left. We front both Stantonsburg Road and Bowman Gray Drive. Driving East on Stantonsburg Road, turn right onto Bethesda Drive. Make an immediate left onto Bowman Gray Drive. Our office is in Suite B at the back of the third building on the left. View the map or view at Google maps. To view directions based on your location, log in to the Patient Portal and click on “Directions”. We admit to the following hospitals: Vidant Medical Center. We have consulting privileges at Vidant Beaufort Hospital in Washington, NC and at Vidant Bertie Hospital in Windsor, NC.